We supply Fiberglass and Kevlar to the boat building and repair industry. Tartan Yachts and C&C Yachts are just a few of our loyal and satisfied customers. Fast shipping and quality products in any quantity from one yard to trucks loads. 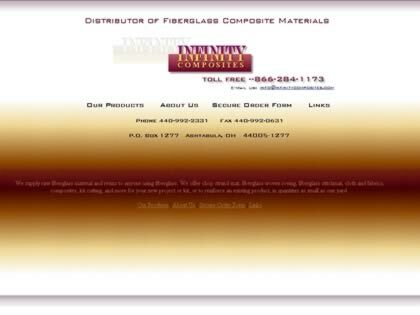 Web Site Snapshot: If available, above is a snapshot of the Infinity Composites Fiberglass Supply web site at http://www.infinitycomposites.com as it appeared when this site was added to the directory or last verified. Please Note that Boat Design Net has no involvement with the above web site; all content and images depicted in the above thumbnail are the property and copyright of Infinity Composites Fiberglass Supply unless otherwise noted on that site. Description: We supply Fiberglass and Kevlar to the boat building and repair industry. Tartan Yachts and C&C Yachts are just a few of our loyal and satisfied customers. Fast shipping and quality products in any quantity from one yard to trucks loads.